RUSH: Grab audio sound bite number 22 and number 23. This was yesterday in Washington on Capitol Hill. A House Financial Services Committee meeting. The subject was the New Green Deal or the Green New Deal, whatever, Representative Sean Duffy, Republican, Wisconsin, had this to say about the New Green Deal. DUFFY: The Green New Deal is one that if you’re a rich liberal from maybe New York or California, it sounds great because you can afford to retrofit your home or build a new home that has zero emissions, that’s energy efficient, affordable and safe. RUSH: Folks, how many people in this country could truly afford to retrofit their homes or build a new one to be in compliance with Ocasio-Cortez and the stupid tenets of the New Green Deal? Nobody could. Not nobody, but the percentage of the American people that could actually do that, it’d be less than 1%. And that was the point that he was making. This is basically a deal for elites. So that didn’t sit well with Alexandria Ocasio-Cortez. CORTEZ: One year ago, I was waitressing in a taco shop in downtown Manhattan. I just got health insurance for the first time a month ago. This is not an elitist issue. Tell that to the families in Flint whose kids have their blood is ascending in — in lead levels, their brains are damaged for the rest of their lives. Call them elitist. You’re telling them that those kids are trying to get on a plane to Davos? People are dying! They are dying! And the response across the other side of the aisle is to introduce an amendment five minutes before a hearing in a markup? This is serious. This should not be a partisan issue. RUSH: (impression) “Their — their — their — their brains! Their brains are damaged. Their blood! Their blood is ascending — is ascending in lead levels!” She used “ascending” four or five times in the entire bite. Now, The Turtle, Mitch McConnell, scheduled a vote in the Senate yesterday on a New Green Deal, and no Democrat voted for it. Not even Ed Markey, who is the cosponsor with Cortez of the New Green Deal in the Senate. No Democrat voted for it. 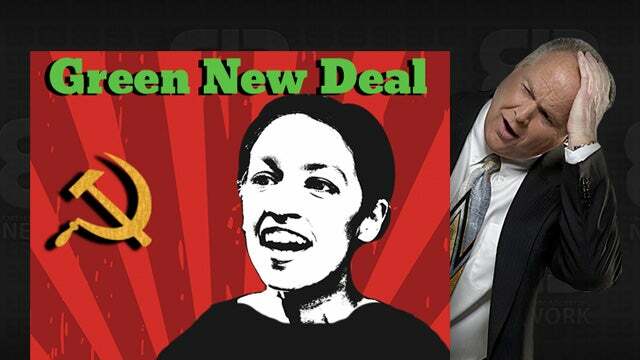 They voted “present” on the New Green Deal — and you know why they voted “present”? Amy Klobuchar called it “aspirational.” But then they had a chance to vote on it, and they voted “present,” because she told them to. She says, “Because I encouraged them to vote ‘present’ along with the others. McConnell tried to rush the Deal.” Why…? If you believe in it, why not vote for it? Why do you even need hearings if it shouldn’t be a partisan issue, as she said in the sound bite? (sobbing) “It’s too important! It’s too important! It shouldn’t even be a partisan issue!” Then why have hearings, if it’s that slam dunk? It’s just… It’s more fake news. It’s more scare tactics. It’s more crisis. It’s more of everything the Democrats do. Paul in Santa Cruz, California. Welcome, sir. We have about a minute here, but I know you can squeeze it in. CALLER: Thank you, sir. We’ve alreday got the Green New Deal out here in California. My wife and I are trying to build a three-bedroom, modest retirement home. We’re spending tens of thousands of dollars on solar energy zero-net usage, California wildfire regulations, storm water management, on and on and on. The engineering and testing is absolutely breaking the budget, and it’s destroying the construction industry out here. Those poor people up in Paradise that have to build replacement homes are gonna have to comply with all these requirements of Jerry Brown and-the-out-of-control legislature and the California Energy Commission. It’s out of control. RUSH: It is. You know, you wonder. When they engineer all of these new requirements, where do they think people are gonna get the money to do this? People don’t have the money to outfit or build homes the way the state is demanding.